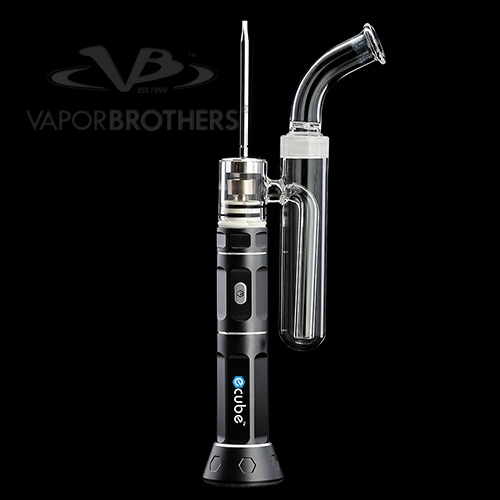 Well built and powerful portable nail with a simple bubbler. Kit comes with Quartz, Ceramic, and Titanium nails. Coming from making our own oil devices, we were wary of moving to portables that couldn't keep up with our demands. 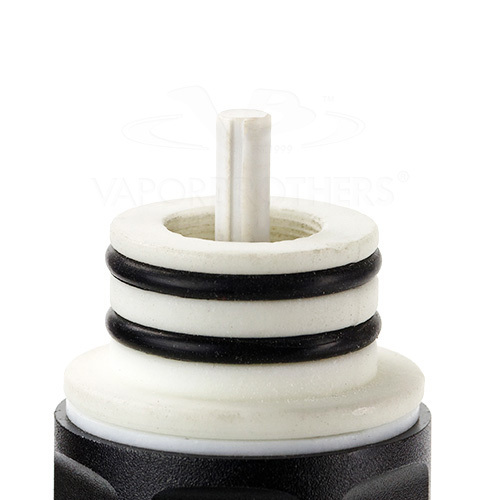 Vaporbrothers requires that product sold on our site are clean to inhale from (no plastic odor or fumes) and that they survive frequent use for a long time. 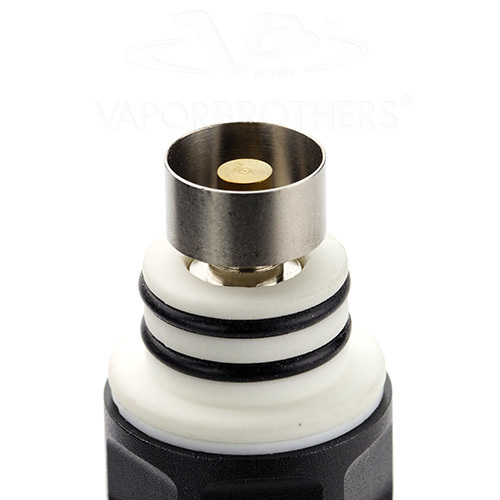 Very few vaporizers get our attention. 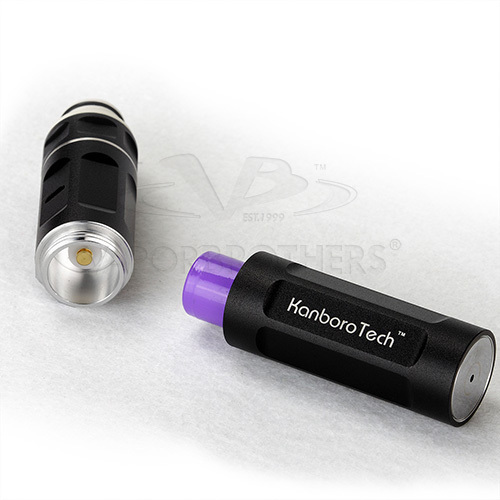 Add to that the severe limitations of having a battery powered vaporizer- there is not much energy in a small battery. 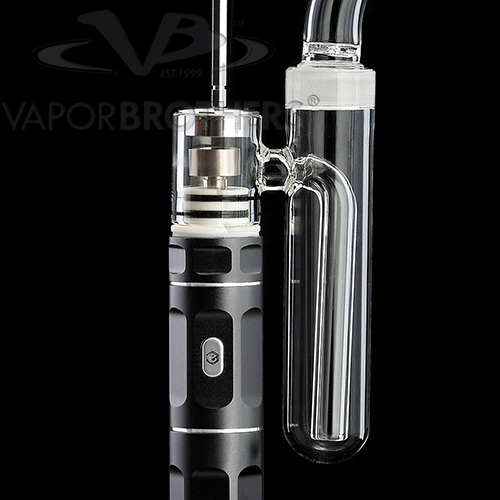 Compared to our last oil rig called VB2.5 that consumed 700W of power to vaporize dabs immediately, we wanted to make sure anything new we found could still give a medical patient a truly effective experience. The eCube met all of our needs and our testers were instantly hooked. 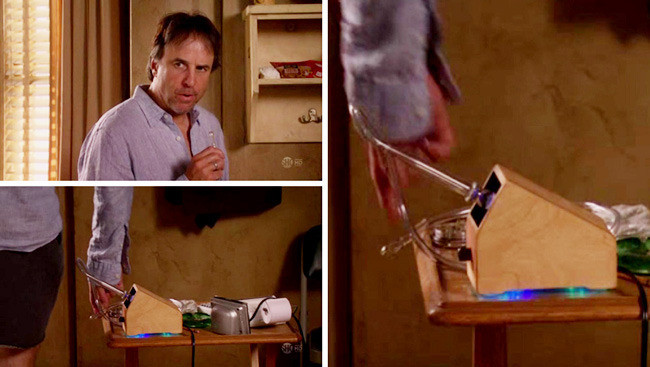 There is nothing to remember, except to push the button to turn it on. If you push 3 times, the nail will heat quickly (Best for use with the Titanium nail). 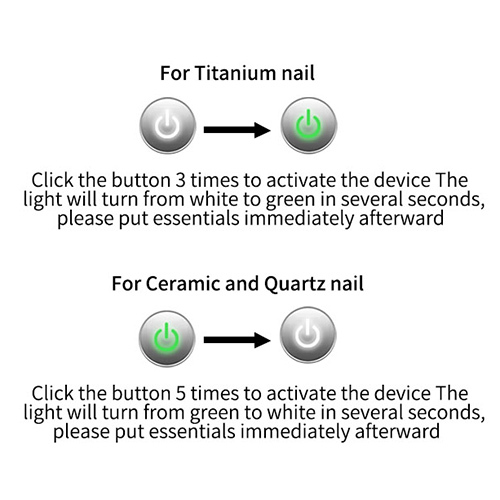 Push 5 times (or more) to heat slowly for best life on ceramic and quartz nails. The unit is ready to use once the button changes color. 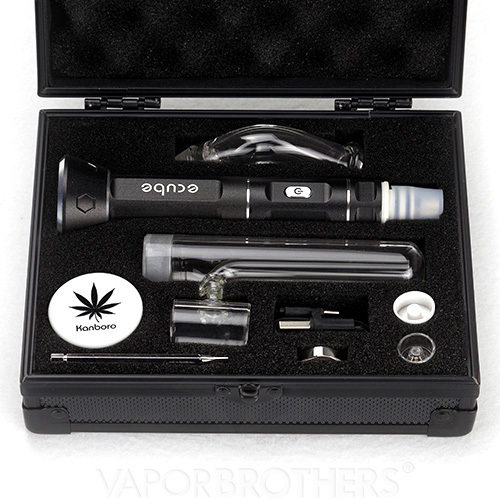 The Kanboro comes in a solid foam filled case with all the parts you need to vaporize. 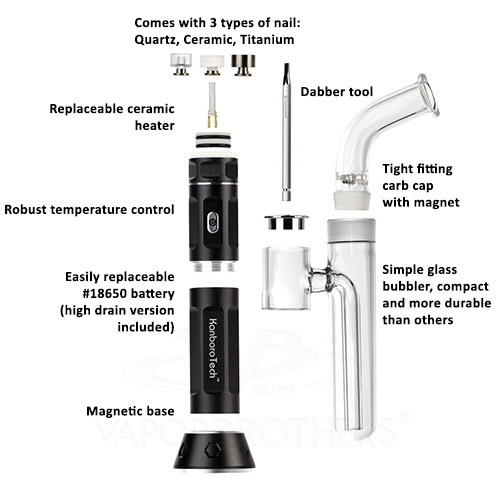 Use the included dabber, which acts as a handle to the magnetic carb cap when they are connected. The eCube operates at an astounding 60 to 80 Watts to get up to temperature quickly. 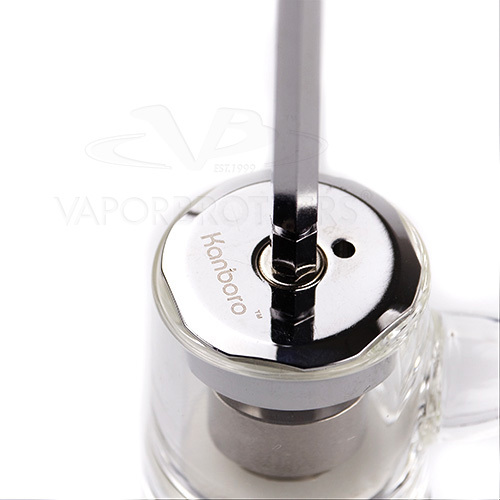 Lower smooth tasting temperatures can be found in the trough of the nail, while higher temperatures (quicker hit, more complete decarboxylation) are on the center pillar. 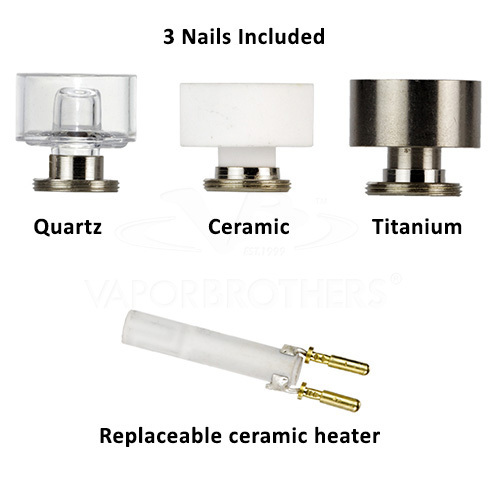 The quartz, ceramic, and titanium nails perform in different ways - Find out for yourself! Please contact us with your questions and suggestions.